The latest á la mode styles in unique wedding rings are black diamond engagement rings and wedding bands. While demand for rings made with lustrous black diamonds is rising, black diamond wedding rings are still quite unique and unusual. 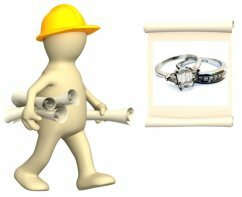 To make sure you find the right type of black diamond wedding bands and rings, and that you pay the right price, check out the info below to find out where black diamonds come from, types of black diamonds, special care for black diamond rings, price guides and essential black diamond shopping tips. Fun Fast Facts About Black Diamond Rings! 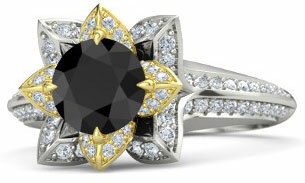 Most black diamonds are created by heat treating real white diamonds. 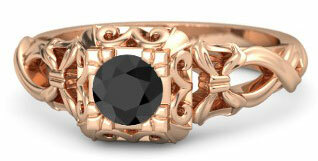 True black diamonds are known as carbonados and are quite rare. 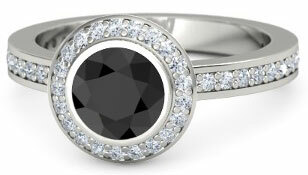 Carbonado black diamonds have different physical characteristics than white and color diamonds. And if you have any questions about black diamond wedding rings, use our handy comment box at the end of the page to send in your questions! Black diamonds are either created naturally by Mother Nature, a type of diamond known as a carbonado, or they are produced by irradiating or heat treating real colorless diamonds or by growing simulant black diamonds in a laboratory. Carbonados have only been found in a few places including Brazil, Venezuela and the Central African Republic. Real quality carbonados which can be used to create stunning black diamond engagement rings or wedding bands are quite rare as most carbonados have variations of color ranging from light gray to deep black and they are often discovered in extremely small sizes. No one knows exactly how carbonados formed in nature, but the leading theories are that carbonados were created from a meteorite impact or space residue from an exploding star, or that they formed naturally deep within the earth from extreme pressure conditions. The most common types of black diamond engagement rings and wedding bands on today’s market are made with black diamonds created by irradiating or heating natural colorless diamonds. These are accepted treatments for many types of gemstones, such as blue topaz, to enhance or create new colors. Irradiated black diamonds have a deep and consistent black color with slight flashes of intense dark green in some types of light whereas heated colorless diamonds often have a lighter gray color. 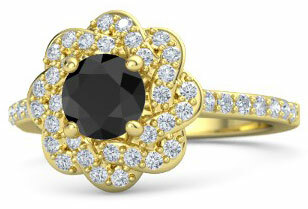 Black diamond engagement rings and wedding bands made with simulant black diamonds are usually made with black cubic zirconia - although this type of simulant does not have the same physical properties as a black diamond (CZ is not as hard and does not have the same brilliant and fire qualities as a black diamond made from a real colorless diamond). I have read from a few resources that black diamonds may also be created through chemical vapor deposition (CVD), a process used to create synthetic diamonds, but I have not found any CVD black diamonds in jewelry. The only CVD black diamond materials which I located through research were those which were created for industrial uses like cutting blades. Carbonados have the exact same specific gravity and density (i.e. weight) as colorless diamonds, and both carbonados and colorless diamonds rate a 10 on the Mohs hardness scale. Carbonados and colorless diamonds also have a rare and high degree of luster, known as adamantine, which causes light to bounce off of the gems. While carbonados share many similar traits with colorless diamonds, they have distinct differences as well. Man-made black diamonds which have been created by heat or irradiation treatment on real colorless diamonds are available in a larger selection than carbonados. As they were once colorless diamonds, they do not have the durability issues which many carbonado diamonds have. Carbonados are also notoriously difficult to cut, even more so than colorless diamonds, and so it can be challenging to find black diamond engagement rings made with a large carbonado gem that has a superior cut – whereas treated colorless black diamonds come in a wide selection of quality cuts, sizes and styles. Black diamond simulants, like black cubic zirconia, will not rate a 10 on the Mohs hardness scale nor will they have the high degree of luster as carbonados and treated colorless black diamonds. For the purposes of black diamond engagement rings and wedding bands, the black diamond simulants may not perform as well over the long run because of their lower durability rating. Black diamonds are not graded like colorless diamonds, instead they are graded based upon qualities which are used to grade fancy color diamonds or colored gemstones. The American Gemological Laboratories (AGL) and the Gemological Institute of American (GIA) offer reports on black diamonds. In these reports, they evaluate the quality of the diamond’s color, clarity and cut. Reports will also include the measurement and weight of the diamond and if the diamond was treated in anyway (some carbonados are heat treated to improve their color) as in the case of colorless diamonds which were treated with heat or irradiation to produce black diamonds. 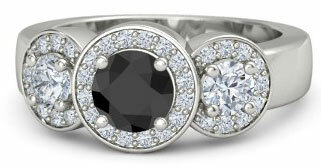 Black diamonds are also often labeled as AAA, AA and A grades with AAA being the highest grade. 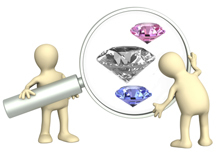 These types of grade labels can mislead consumers though, as there are no laws or regulations which define the differences between AAA, AA and A gemstones. So, it’s pretty much up to the retailer to decide if their black diamonds meet AAA standards of a quality cut and polish – not surprisingly most retailers advertise their black diamonds as AAA diamonds. 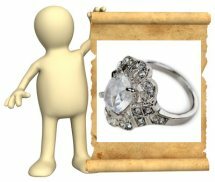 While some retailers are offering an honest assessment of their black diamonds, consumers shouldn’t rely on these labels when they are shopping for black diamond wedding rings. Black diamond prices are all over the board due to the selection of carbonados, colorless treated black diamonds and black diamond simulants. Carbonados are also increasing in value due to increased consumer interest and demand for black diamonds, and the prices for these truly natural black diamonds are continuing to change. At the moment, as an average base price, natural carbonados with a good cut and color are priced between $1,500 to $2,000 dollars for one carat loose stones. The price of carbonado black diamonds will dramatically increase according to size (over one carat and prices start to double and triple and so forth) and the quality of the cut (supreme cuts will fetch much higher prices than ‘good’ cuts). The value of natural carbonados may continue to increase with time, but if consumer interest in black diamond jewelry wanes than the overall value may just hold to the original purchase price. Colorless white diamonds that have been treated through heat or irradiation to produce black diamonds have a wide range of prices as well. Some are much cheaper than natural carbonados, because the colorless diamonds that were heated had poor clarity and color characteristics to begin with. Others are more expensive based on the cut and the quality of the original colorless diamonds (although, rare colorless diamonds with supreme clarity and color characteristics are never treated to produce fancy black diamonds because a great deal of their value would be lost). Shoppers can find black diamond wedding rings made from colorless diamonds for less than $1,000 per carat or even over $2,000 a carat – it just depends on the quality, size and cut of the diamond. Simulant black diamonds are the most affordable, with prices starting as low as $10.00 per carat, although quality cut simulant black diamonds may be priced from $20.00 to $50.00 per carat. 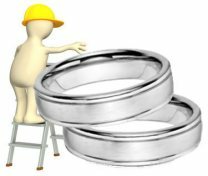 Black diamond engagement rings and wedding bands will be priced higher than the base loose gemstone prices according to wedding band metals and workmanship. 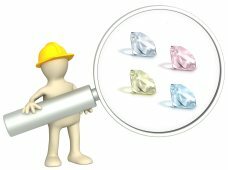 Natural carbonados, colorless treated black diamonds and black diamond simulants should not be cleaned in ultrasonic cleaners as the color of the diamonds can be affected. Carbonados can be more prone to cracking and chipping because of their porous nature, so black diamond engagement rings and wedding bands made with carbonados should not be exposed to hard knocks or blows. Avoid exposing carbonados to harsh chemicals as well. 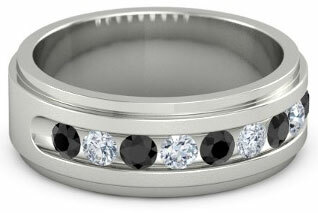 Black diamond engagement rings and bands made with simulants should be treated with special care to ensure they last. 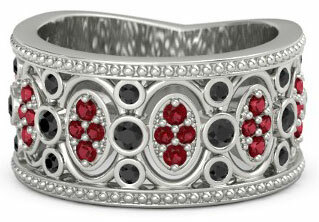 Remove black diamond simulant rings before swimming and washing dishes. Avoid exposing the simulants to lotions or oils and chemical, and store the rings in a safe protected place to make sure they do not scratch. Avoid exposure to knocks and blows. 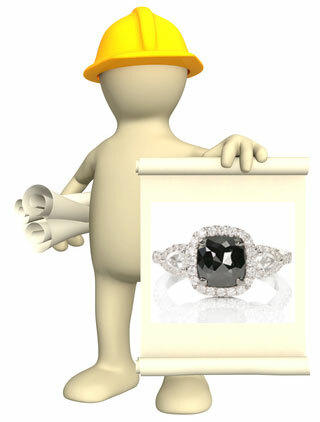 Colorless treated black diamond engagement rings and bands do not require any other type of special care other than avoiding ultrasonic cleaning (some retailers say it is okay to use ultrasonic cleaning on black diamonds, but gemologists recommend avoiding this cleaning method just to be on the safe side). With an increased interest in black diamond engagement rings, wedding bands and men’s black diamond rings, many companies have been producing more and more black diamond wedding rings to meet demand. However, consumers need to take care due to an increase in misleading advertising and downright scams which are tainting the black diamond jewelry market. 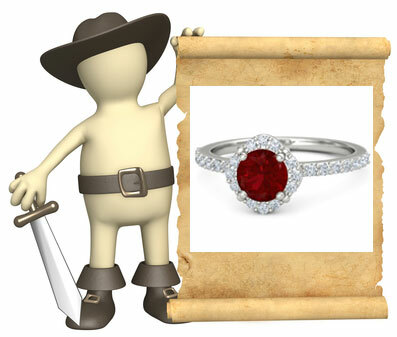 As with any other type of gemstone jewelry, always protect yourself first by ensuring that you are purchasing black diamond wedding bands and engagement rings from a reliable retailer or jeweler who has a clear history, excellent reputation and a no-nonsense refund policy. 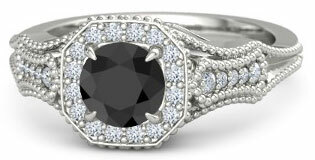 Simulant black diamonds - like cubic zirconia - do not have the same physical characteristics as real diamonds. Synthetic black diamonds - created by heat treating or irradiating real colorless diamonds - will have the same physical characteristics as real diamonds. 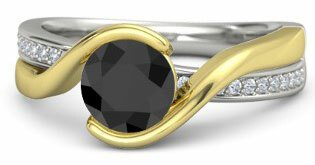 Keep in mind too that true gemstone quality natural black diamonds, or carbonados, are extremely rare. They are difficult to find, especially with a quality cut, and are priced at around $1,500 to $2,000 for a one carat stone. If you find a low priced carbonado with a quality cut and color, chances are it’s not a carbonado (remember, most carbonados have black, grey and even white color variations and are usually not completely solid black). Beware retailers that are selling black cubic zirconia, black onyx and even black cut glass as real carbonados or real colorless diamonds that have been treated. 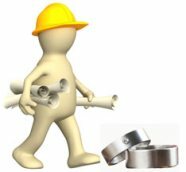 Again, you can start protecting yourself by ensuring that you only purchase your ring through a reputable retailer. If you have any doubts, a local certified gemologist can assess the black diamond and determine if it is a real diamond or a simulant through simple and affordable weight, conductivity and optical tests – if the retailer was not honest, return the ring with your return policy and then report the retailer for false advertisements. 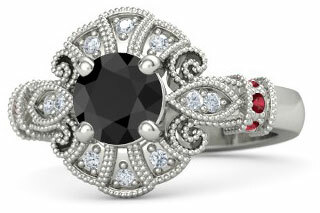 Questions or comments about black diamond engagement rings and wedding bands? 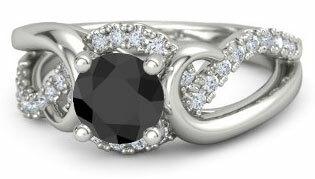 Send in your questions and comments, or upload pics of your black diamond rings here! 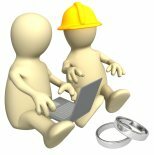 I will post answers to your questions as soon as possible. Engagement Ring & Wedding Band Picks by Gemvara!